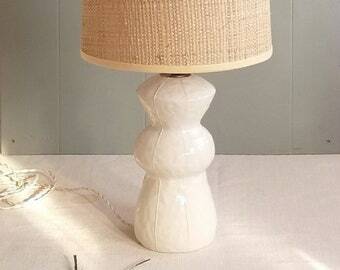 This "Retro" ceramic lamp is just the right size and shape to be a bedside table lamp. 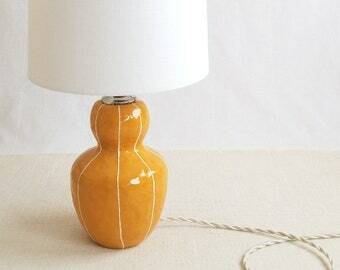 It's small scale makes it also perfect for other cozy interior lighting situations. 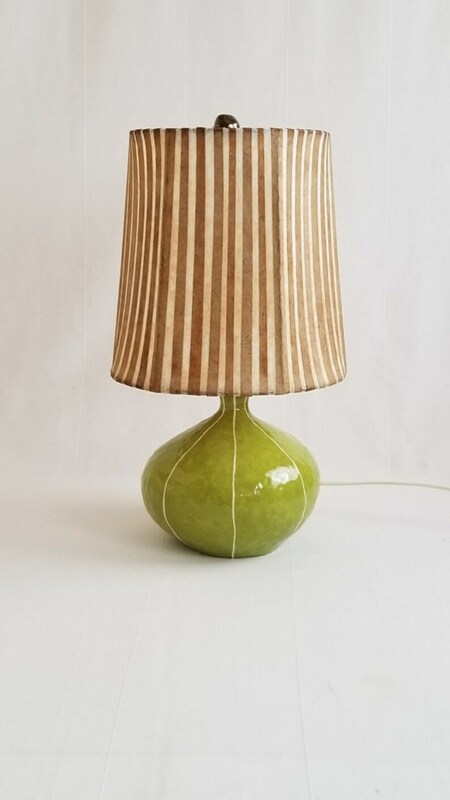 I call this piece "Retro" because the round base and thin neck remind me of shapes from the 1950's and 60's. 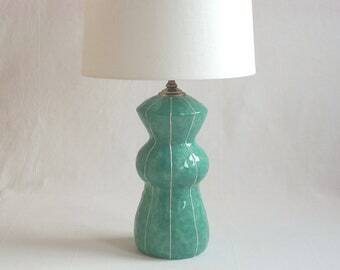 My lamps are slip cast, glazed and fired in my studio, kRI kRI Studio, in Seattle. The original shapes are created by hand using the coil and pinch technique. 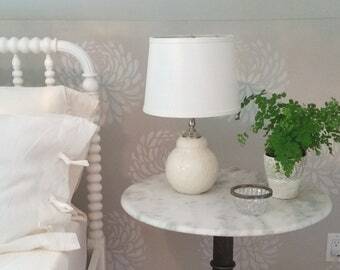 This gives them a softly dimpled surface that reflects light in a pleasing way. Thin,raised white stripes detail each piece. 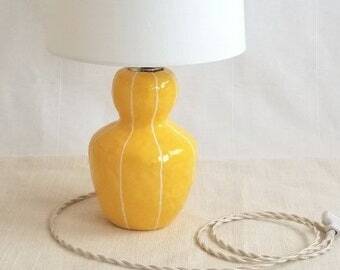 Because they are made by hand, my lamps are not perfect in the way a factory produced lamp is. Instead, they are perfectly imperfect and it is those slight imperfections that give them their individual character. 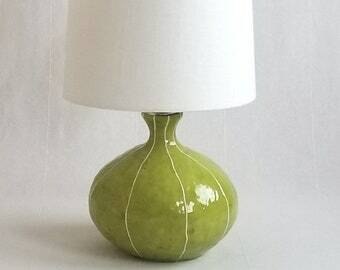 The shade for this lamp is by Jil Smith, a colleague of mine. She creates her shades by hand cutting Japanese rice paper and collaging it to a metal frame. The result is a very strong shade that is resistant to fading. Suitably festive Rifle Paper Co. wrap with orange ribbon outside. Inside item is wrapped in gray tissue, sealed with an orange, VIT ceramics sticker. Prompt shipping, good packaging that kept the vase intact, and most importantly, the vase is absolutely beautiful! Will definitely order from this shop again! Absolutely lovely! The color I received is Jade, just beautiful, I recommend and will buy from seller again. Love, love, love this lil thing! Just the pop of color I needed! Oh my goodness...I bought two of these and they are divine! Beautifully packaged for their safe arrival in London! Very happy! We accept Paypal, Etsy direct checkout and checks. If you pay by check, we will wait until we receive your check before shipping. If your purchase arrives damaged, we will give you a refund, or try to replace it for you. We ask that you send a photo of the damage with and explanation. If you are completely dissatisfied with your purchase, return it undamaged and we will refund you the cost of the item. We aim to ship in 1 to 5 business day. You will be notified when your order is shipped and if there is a delay. Packages are sent via UPS and USPS. Any of my items are available in any color seen in my Etsy shop. If you don't see the item you want in the color you want, please ask for it. It can usually be made and shipped in a weeek. My ceramics are safe for food and are dishwasher safe. 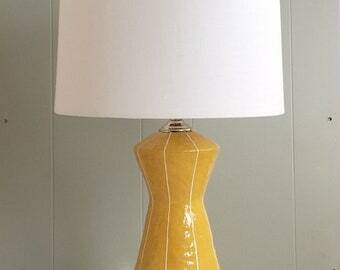 Pair of ceramic finials for lamps. Modern home decor update. Interior lighting. Metallic finish. Unique home detail. Lampshade accessory.